Infrared laser spectroscopy offers amazing measurement resolution for gas sensing applications, ranging between 1 part per million (ppm) down to a few parts per billion (ppb). There are applications, however, that require sensor hardware able to operate in harsh conditions, without the need for periodic maintenance or recalibration. Examples are monitoring of natural gas composition in transport pipes, explosive gas accumulation in grain silos, and ethylene concentration in greenhouse environments. A robust alternative is embodied by gas-coupled acoustic sensing. Such gas sensors operate on the principle that sound waves are intimately coupled to the gas under study hence any perturbation on the latter will affect i) how fast the waves can travel and ii) how much energy they lose during propagation. The former effect is represented by the so-called speed of sound, which is the typical “workhorse” of acoustic sensing. The reason the sound speed of a gas mixture changes with composition is because it depends on two gas parameters beside temperature. The first parameter is the mass of the molecules forming the gas mixture; the second parameter is the heat capacity, describing the ability of the gas to follow, via the amount of heat exchanged, the temperature oscillations accompanying the sound wave. All commercial gas-coupled sonic gas monitors rely solely on the dependence of sound speed on molecular mass. This traditional approach, however, can only sense relative changes in the speed of sound hence in mean molecular mass; thus it cannot do a truly quantitative analysis. Heat capacity, on the other hand, is the thermodynamic “footprint” of the amount of energy exchanged during molecular collisions. It therefore opens up the possibility to perform quantitative gas sensing. Furthermore, the attenuation coefficient, which describes how fast energy is lost from the coherent (“acoustic”) motion to incoherent (random) behavior of the gas molecules, has largely been ignored. 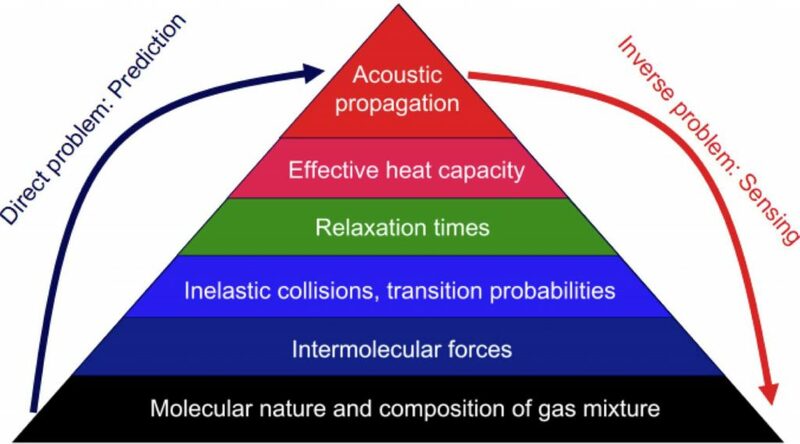 We have shown that measurements of sound speed and attenuation at only two acoustic frequencies can be used to infer the intermolecular energy transfer rates, depending on the species present in the gas. The foundation of our model is summarized in the pyramid of Figure 1. One can either predict the sound speed and attenuation if the composition is known (bottom-to-top arrow) or perform quantitative analysis or sensing based on measured sound speed and attenuation (top-to-bottom arrow). We are developing physics-based algorithms that not only quantify a gas mixture but also help identify contaminant species in a base gas. With the right optimization, the algorithms can be used in real time to measure the composition of piped natural gas as well as its degree of contamination by CO2, N2, O2 and other species. It is these features that have sparked the interest of the gas flow-metering industry. 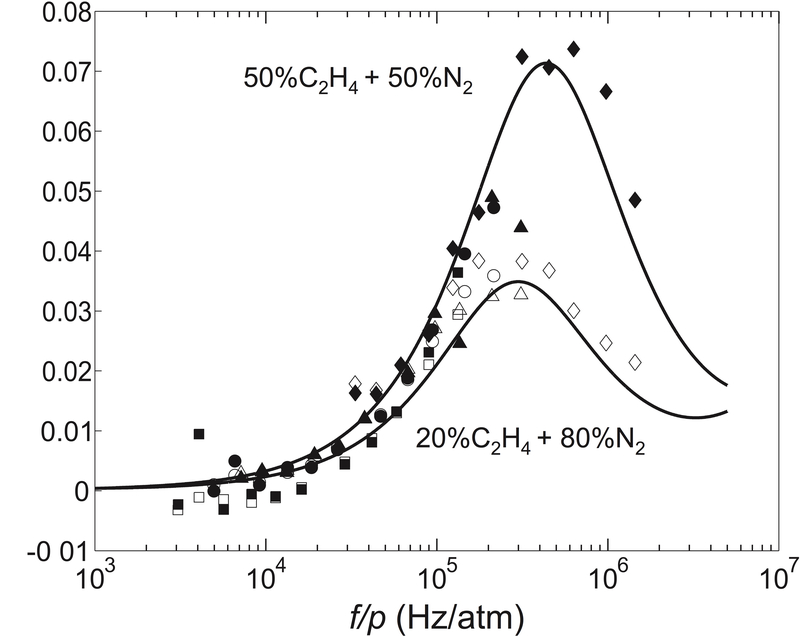 Figure 2 shows model predictions and experimental data for the attenuation coefficient for mixtures of nitrogen in methane (Fig. 2a) and ethylene in nitrogen (Fig. 2b). The sensing algorithm that we named “Quantitative Acoustic Relaxational Spectroscopy” (QARS) is based on a purely geometric interpretation of the frequency-dependent heat capacity of the mixture of polyatomic molecules. This characteristic makes it highly amenable to implementation as a robust real-time sensing/monitoring technique. The results of the algorithm are shown in Figure 3, for a nitrogen-methane mixture. The example shows how the normalized attenuation curve arising from intermolecular exchanges is reconstructed (or synthesized) from data at just two frequencies. 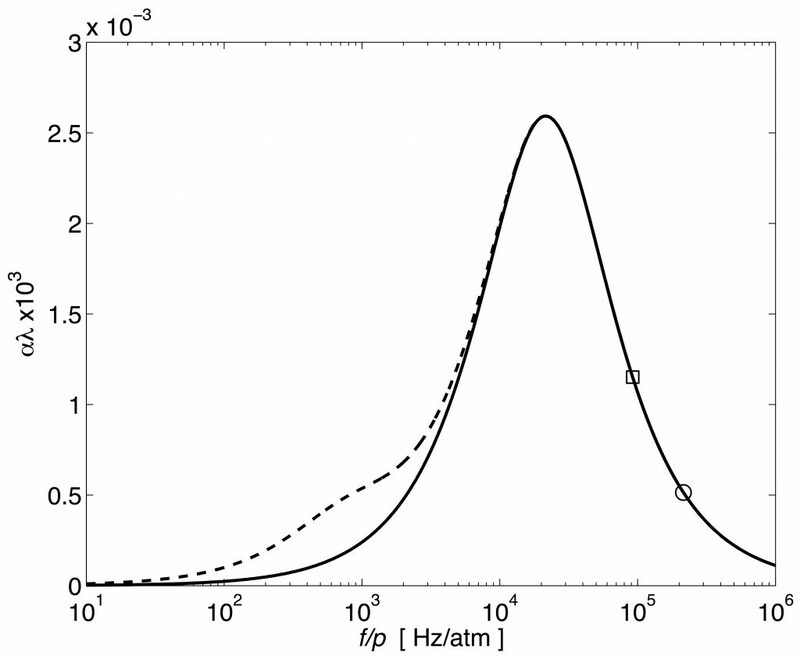 The prediction of the first-principles model (dashed line) shows two relaxation times: the main one of approximately 50 us (=1/20000 Hz-1) and a secondary one around 1 ms (=1/1000 Hz-1). Probing the gas with only two frequencies yields the main relaxation process, around 20000 Hz, from which the composition of the mixture can be inferred with relatively high accuracy. Figure 1. The prediction/sensing pyramid of molecular acoustics. Direct problem: prediction of sound wave propagation (speed and attenuation). Inverse problem: quantifying a gas mixture from measured sound speed and attenuation. Figure 2. 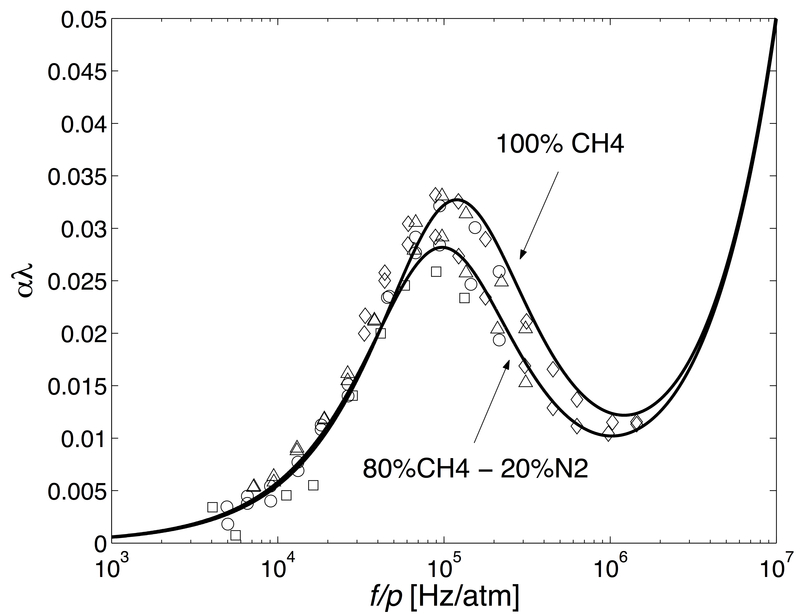 The normalized (dimensionless) attenuation coefficient in mixtures of N2 in CH4 (a) and C2H4 in N2 (b). Solid lines–theory; symbols–measurements. Figure 3. The normalized (dimensionless) attenuation as a function of frequency. Dashed line–theoretical prediction; solid line–reconstructed curve.